If you’re wondering where to stay in Sofia, don’t worry – we’ve got your back! We’re both expats who have made Sofia our home, so we know this city well. As we have a lot of people visiting us over the years, we have done our research on the best hotels in Sofia to recommend to our friends. We’ve also been asked a lot about what hostels in Sofia are the best, so we’ve provided some recommendations on those for travelers on a budget. Luckily, there’s pretty much only good news when it comes to accommodations in Sofia! As Sofia is a relatively small city with a compact center, it is quite easy to find a centrally-located hotel in Sofia without breaking the bank. 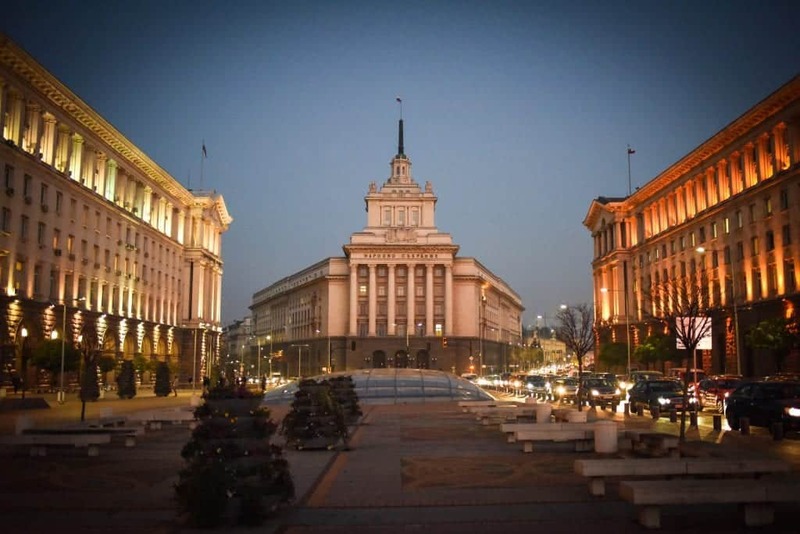 This city is relatively under-touristed, and hotel vacancy is rather high compared to other cities in Europe, which means there are plenty of hotels in Sofia vying for your tourist dollar. As a result, there are plenty of deals to be found when looking up where to stay in Sofia! Sofia is a great budget destination any time of year! For ease of use, we’ve broken up this guide into three general price ranges. As of the time of writing this post, the hotels all fit into these categories. However, as demand fluctuates, peak travel times come and go, and hotels adjust their prices. You may find that the hostel, hotel, or guesthouse you’ve clicked on may not quite fall into that range. So let this be a general guide and always check prices before booking. For starters, here is a general range of what we mean by each budget category, converted to USD for ease of understanding. When asked by budget travelers for a hostel in Sofia to recommend, we always choose Hostel Mostel. Located near Vitosha Boulevard, the main pedestrian street in Sofia, it is pretty much as central as it gets! I have never stayed at the Sofia location but several of my friends have and have always spoken highly of it. I stayed at the one in Veliko Tarnovo and it was excellent. Perks include a free (!) vegetarian dinner in addition to breakfast included in your stay! If you are traveling in peak season (May through September), be sure to book online in advance, as Hostel Mostel is popular and tends to get booked up. Check rates and availability here. I’ve never stayed here but I have spent time chilling in their lovely garden area and drinking in the summer with a friend who was staying there. The vibe is really friendly and social, plus it’s located in one of my favorite areas of Sofia, the area around G.S. Rakovski Street but north of Alexander Nevsky, where many of my favorite bars and restaurants are located within a short distance. Check rates and availability here. Most hostels will assist you in booking tours to places like Rila Monastery! For a trendy new boutique hotel that is surprisingly affordable for how beautifully deisgned, it is, we highly recommend R34 Boutique Hotel. The location is fantastic, near the Ivan Vazov National Theater in central Sofia, which is one of the most beautiful buildings in the city. This hotel has gorgeous, loft-inspired details like exposed brick, giant windows, and streamlined but modern décor. Imagine a Brooklyn loft but with Eastern European prices, and you’ve got a good idea of this hotel. It’s a great bargain, too – check rates, reviews, photos, and availability here. Located on William Gladstone street, one of my favorite streets in Sofia, a short walk from Vitosha Boulevard, Art’Otel is an excellent choice that won’t break the bank. With 4 stars, this hotel offers great perks like a delicious breakfast, a sun terrace with views of the beautiful Mount Vitosha, a sauna, a fitness center, and other wonderful amenities. For a 4-star hotel in a great location, this is a great choice for visiting Sofia. Check out rates, reviews, photos, and availability here. 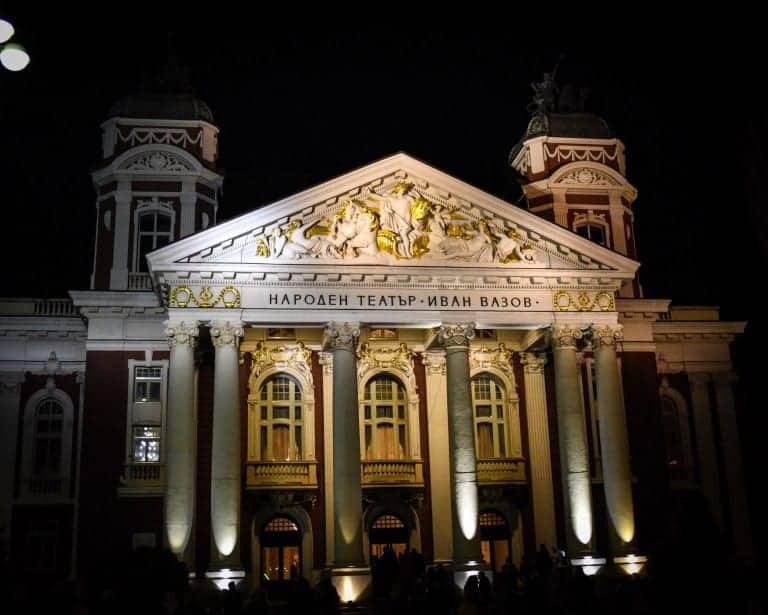 The beautiful Ivan Vazov theater is a hard location to beat! As far as we see it, there’s only one option for the best hotel in Sofia’s city center: Sense Hotel. We go to their upscale, beautiful rooftop bar pretty much every single time that we have guests in town – it has one of the best views in the entire city and they make fantastic cocktails. 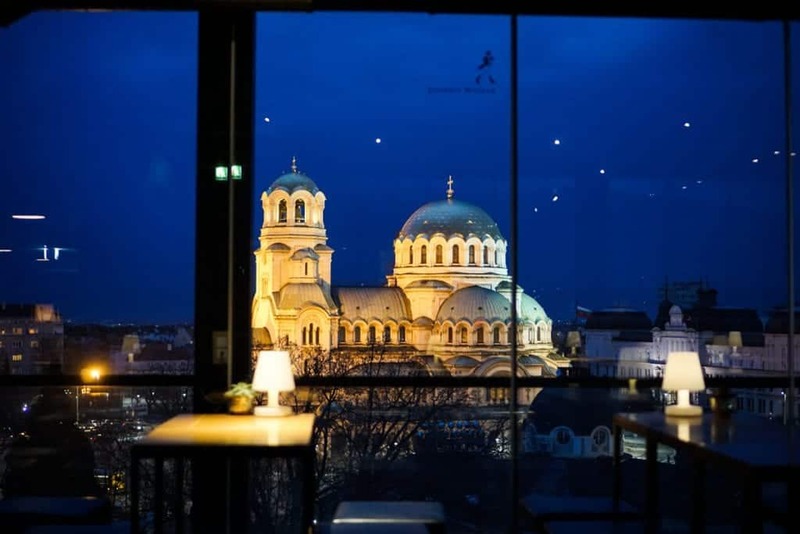 With beautiful views over Alexander Nevsky, Sofia’s most iconic landmark, from the rooftop bar and many of its hotel rooms, Sense Hotel couldn’t have a better location. In addition, Sense Hotel also boasts a state-of-the-art fitness center, an art gallery in the lobby, an excellent spa with luxe treatments, and an indoor pool. Also, the lobby smells freaking magical. It’s truly the best choice in town if you have the money to spend (and it costs less than you might think). Check rates, reviews, photos, and availability here. 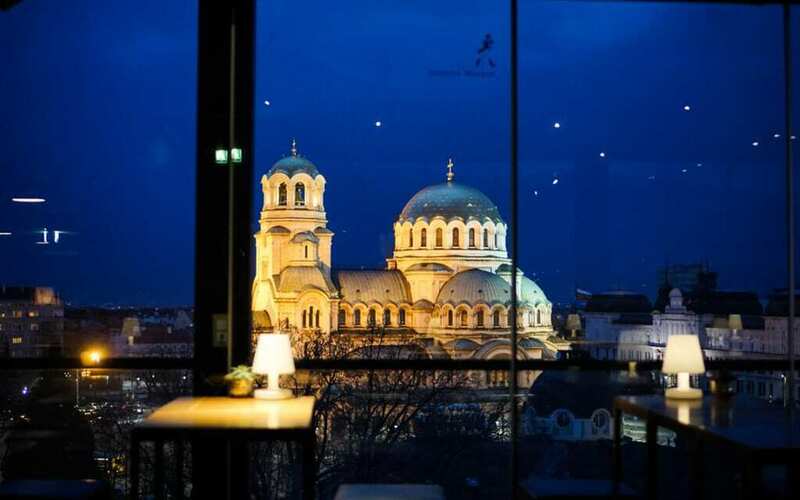 Sense Hotel has the best views in Sofia! Overlooking Sofia’s beautiful City Garden with its majestic Ivan Vazov National Theater, you may never want to leave Grand Hotel Sofia. This 5-star hotel in central Sofia has some amazing amenities for guests to enjoy, including an original collection of over 400 oil paintings. The Shades of Red restaurant overlooking the park offers excellent views with even better food. Meanwhile, the Grand Café is an open-air terrace which is a great way to people-watch in City Garden from within a cozy, lushly-green terrace. In addition to all the usual perks – bathtubs, flatscreen TVs, bathrobes and slippers, etc. – guests can also enjoy a fitness center, a 24-hour lobby bar, room service, and even a complimentary yoga set (DVDs plus mats) brought to their room. It’s a popular choice, so be sure to book in advance, especially in high season. Check out rates, reviews, photos, and availability here. 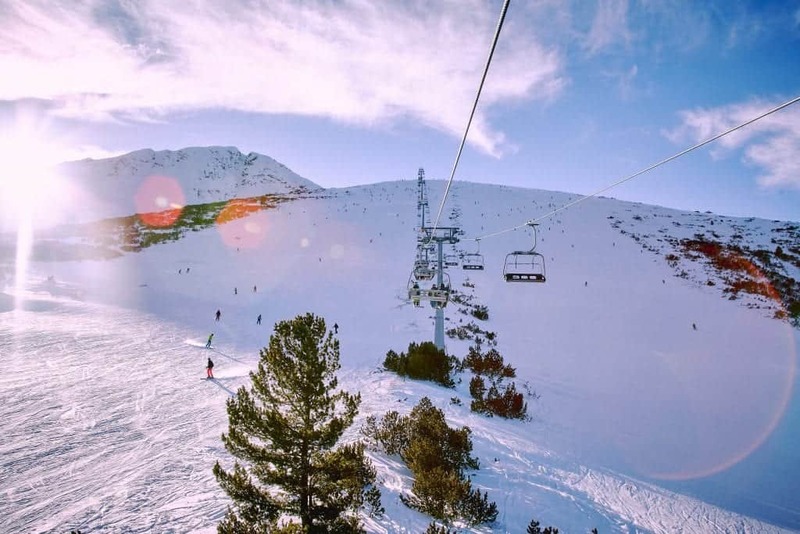 Perhaps you don’t want to stay in the center of Sofia but prefer a luxurious escape at the base of Vitosha, Sofia’s very own 2290-meter mountain that is a haven for hikers in summer and an escape for skiers in the winter. The All Season Residence offers just that at a 5-star hotel in Sofia’s trendy Boyana district. Boyana is the favorite haunt of celebrities who are staying in Sofia while filming movies at the Nu Boyana studio (Gerard Butler recently broke the internet in Sofia when he took a break from filming in Boyana to walk around downtown). 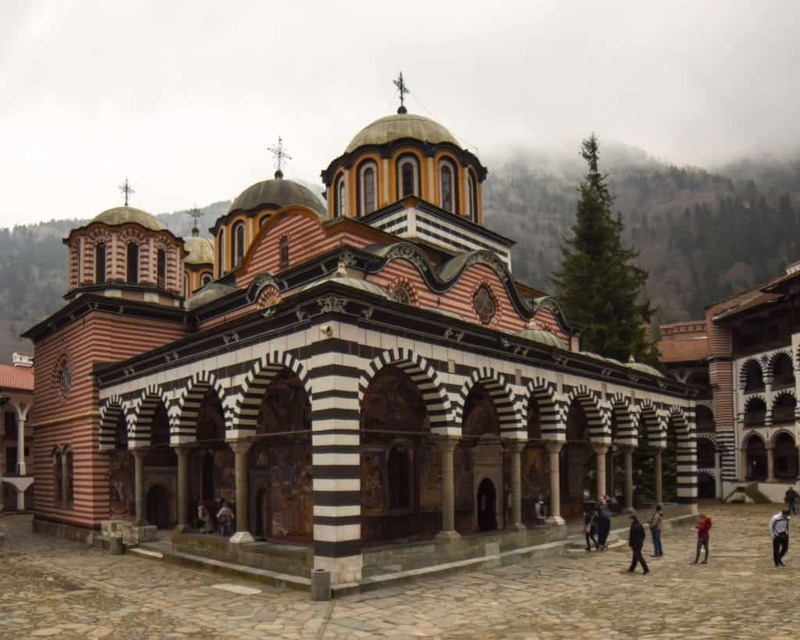 Boyana is home to fantastic restaurants like Cinecitta as well as attractions like the UNESCO-listed Boyana Church and the Boyana Waterfall, so much so that you may not even need to head into Sofia center. While it may seem you’re a world away from the city on a private 5-star retreat, in reality, central Sofia is just a 15-minute, 15 leva (around $8 USD) cab ride away. However, it’s not the most convenient location to get to Sofia center using public transportation, so do keep that in mind when considering this hotel. 5-star luxury at Sofia prices (when I looked, it was under $100 per night), on a mountain while still being a quick ride from the city? We’re sold. Check rates, reviews, photos, and availability here. Finally, make sure you always travel to Sofia with a valid travel insurance policy. While the city is a very safe place to travel these days, you want to make sure you have your possessions covered if they’re stolen and your medical bills covered if you get sick or injured. This is especially true if you plan on enjoying the city’s nightlife or hiking in Rila or Vitosha. Do you have any hostels or hotels in Sofia to recommend? What do you think is the answer to the question, where is the best place to stay in Sofia? Let us know in the comments! Just wondering, do you know anything about hotel Inter Continental Sofia? How does it compare to the other 5-star hotels? We haven’t stayed there personally… I would check the reviews on Booking.com as they’d be more accurate as they’re from guests who have actually stayed there! Personally, our favorite is Sense Hotel (we haven’t stayed there as we both live in Sofia, but we’ve been in the building a ton of times and up at their rooftop bar and we think it’s an incredible property). Hi Allison. I will check the online reviews once more. They were very good last time I checked, but things could change. The rooftop bar at the Sense I guess is open to visitors as well. Sounds like a good plan – and yes, the rooftop bar is open to all!